My photograph, based on the word “pride”, displays feelings of joy, self-love, and gratitude. The red carnations represent pride and beauty, and the expression on the model’s face expresses pure happiness and contentment with life. After this project, pride holds so much more emotional value to me. Pride is humble, pride is sinful, pride is colorful and fills the room with light; all these different views and meanings for one word is taken on and given to these other artists, all without them knowing. Although we ended up far from the traditional definition of “pride”, we’ve created our own unique definition for ourselves. Our pride is a cycle, a process, a loss, and a warmth: it’s Being Human. Breanah W., Aidan Z., Amina B. When listening to Strand 2, we immediately felt a sense of calm and a connection to nature. 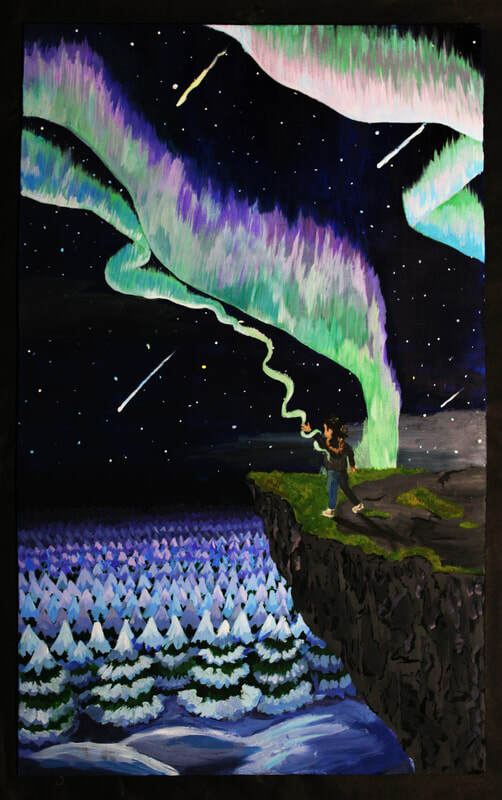 For our piece, we created a figure standing on the edge of a cliff overlooking a landscape of snow covered trees and northern lights illuminating the night sky. The girl reaches her hand towards the northern lights while a single strand of light spirals around her outstretched arm. Cool colors were used to capture the feel of a cold winter’s night while warmer hues helped illuminate the scene and add balance to the composition. When we sent this on to the next group we intended the viewer to feel as though they were the actual figure standing on the cliff breathing in the cold night air and being physically connected to the environment. ~Jesus H., Katherine R., Maricela Z. When my partner and I first saw the painting, we thought it was pretty clear. It was a girl reaching for the stars, but then we saw something more. We imagined the painting as a video. We saw the snow on the ground and figured if the girl ever talked, we would see her breath. We saw the clouds and they were moving in. The clouds would cover the northern lights and there would be nothing else surrounding her but dusk. The lights that she was reaching for were gone and she wanted to get them back, even though she knows she can't. Our dance is a continuation of this story. ​~Veronica S. and Shayne R.